It took all day to get here – 80km. That’s because we stopped in Sint Truiden for breakfast but the cook didn’t start work until 10 and then there was a thunderstorm with impressive display of lightning and then we went to the tourist office and the bike shop and the railway station for wifi and then had a problem with Mastercard and only left there after midday. Then we had lots of stops and navigation errors (even Mr Garmin is finding it a challenge at times). Scenery highlights: fields of wheat, barley and some other grain (maybe buckwheat), silver beet, cabbages, potatoes, pears, cherries, red currants, popp﻿ies and wild flowers along the road, Roman roads, window boxes with geraniums and petunias everywhere, churches, steeples. narrow streets. In Belgian villages they have bread machines – same concept as Coke machines. You put your money in and get a loaf of bread out. I guess this is a symptom of the decline of local bakeries. We crossed a linguistic border at lunchtime around Hannut and now everybody speaks French (including us and M. Garmin). I dredged out some schoolboy French (poorly studied 35 years ago) and succeeded in getting our bidons filled by a Walloon – she quickly exhausted my language skills. 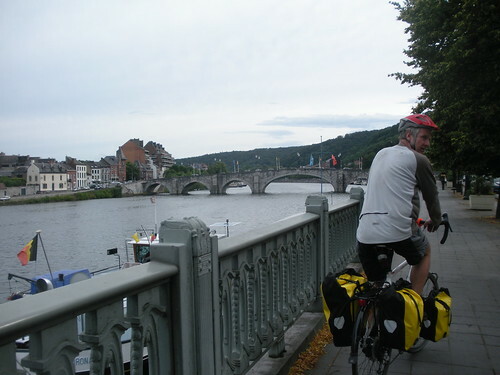 At last we reached Namur, in a beautiful setting by the River Meuse. Have to get to Charleville Mezieres tomorrow to keep on schedule and may seek the assistance of le chemin de fer. This entry was posted on 12 July 2010 at 9:20 pm and is filed under Belgium. You can follow any responses to this entry through the RSS 2.0 feed. You can leave a response, or trackback from your own site.